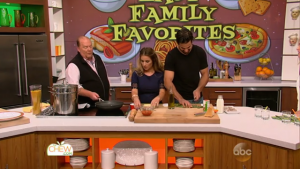 Eric and Jessie James Decker show how to make a family favorite on The Chew. Eric Decker and Jessie James Decker join FOX 17 to talk about the E & J Foundation and their work with dogs in shelters as well as veterans. The foundation helps save dogs from shelters, train them and pair them with service members suffering from PTSD. 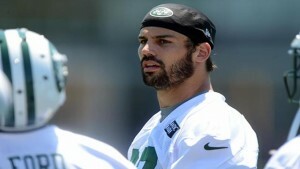 New York Jets wide receiver Eric Decker talks about his first season experience on the Jets. New York Jets wide receiver Eric Decker talks about Jets first round draft pick Leonard Williams and how he will contribute to their defensive line. 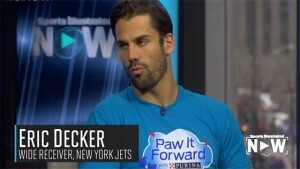 New York Jets wide receiver Eric Decker talks about his experience playing for former New York Jet head coach Rex Ryan. Eric Decker of the New York Jets teamed up with Kevin Love of the Cleveland Cavaliers for Buffalo David Bitton's "Love Decker Challenge”. The two athletes met on the basketball court to see who could make the better shot. 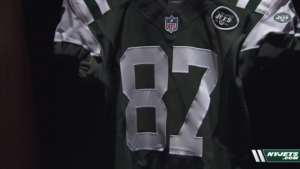 Playmaking WRs Kurt Sohn, Laveranues Coles and Eric Decker Have Donned the Number. Eric Decker appears in wife Jessie James Decker's newest music video "Clint Eastwood."